You leave Debenham, and you enter a land of apple orchards, mile after mile of them. This is the Chevallier estate, home of the Aspall Cyder Company, still owned by the Chevallier family of Aspall Hall. The family came here from the Channel Islands in the 18th Century to make cyder, and were using the same apple-crushing wheel until fairly recently. The company has undergone something of a revolution in the last ten years though, being launched as a national and even international brand, and an industrial-scale cyder plant now rises incongruously above the Debenham to Eye road. The family name is remembered by Chevallier Street in Ipswich. A long straight road cuts westward through the orchards, and leads us into a gentle dip. 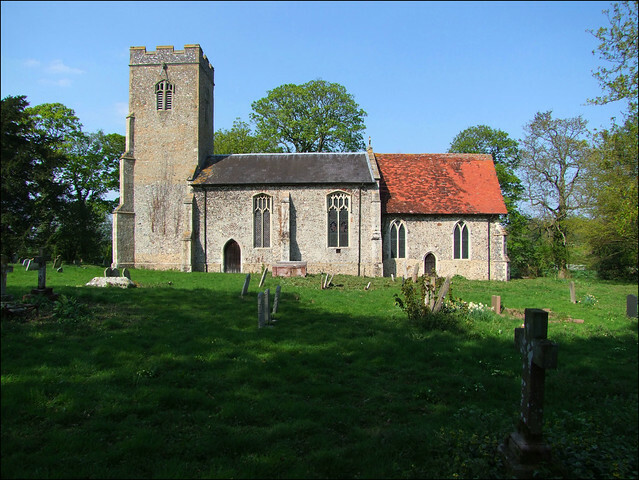 This is the tiny village of Aspall, not to be confused with the larger Stonham Aspal on the far side of Debenham, and the church sits there with its attendant houses. The setting is completely rural, although thoroughly 19th century. On the occasion of my first visit, the little lodge beside the church gate had a brace of pheasants hanging from its door. I didn't get to see inside the church on the occasion of that first visit, and I didn't when I came back in 2011 either. But in between times, something seemed to have happened. It appeared that the church had been pretty much abandoned, and the ivy allowed to creep over it. I could find no evidence that the church was still in use, but over the last months some attempts seemed to have been made to rescue it, the bleak strimmed undergrowth and the dead ivy still clinging in upper reaches evidence of this. The church still had a desperate air of neglect in comparison with its neatly kept near-neighbours, and there was obviously no keyholder notice. Although the Victorians were busy here, adding a north transept and generally giving the place a makeover, there is still the 15th century tower. The locked north porch is rather pretty, with banding characteristic of the 17th century. The west door has been blocked, but its age is revealed by the array of brick and flint above it. A trefoil window is there now. In the graveyard, just to the north-west of the church, you will find the grave of the film producer Emeric Pressburger. The inscription, from Scott's A Matter of Life and Death, reads: Love rules the court, the camp, the grove, This world below and heaven above, For love is heaven, and heaven is love. Pressburger's biography, The Life and Death of a Screenwriter, by Kevin Macdonald, notes that he had expressed a wish to be buried in the village church at Aspall. It was a cold dreary day and a small funeral, a few friends from the village, theSchopflinns, my brother and I and our father. Michael was unable to come. Martin Scorsese sent flowers. At the last minute a long-forgotten Yugoslav cousin rang from Belgrade to ensure we gave our grandfather a Jewish burial. He assured us that Emeric had been a practising Jew. No one else could remember him going near a synagogue. As a concession, the liberal Anglican vicar allowed a Star of David to be engraved on his grave stone. And there it is today. The Chevallier graves are to the south-east of the church. Among them is one to Peronelle Mary Guild, the grand dame of the Chevallier dynasty, who gave her name to the company's 'blush' cyder, popular with London's fashionable young things I'm told. The Chevalliers, as the owners of the Manor, supplied Rectors to the parish throughout the 19th century. Arthur Mee in The King's England recalls John Chevallier. He was Rector in the mid-century, and was also the village Doctor. He lived in the Hall, where he prepared a clinic. Most famously, he was the person responsible for cultivating Chevallier barley, a high-yield variety; it was taken out into the Empire, and provided three-quarters of the world's barley crops by the century's end. John's daughter Anne married into the Kitchener family, and her son became Lord Kitchener, whose propagandising and ranting persuaded hundreds of thousands of young Englishmen to their deaths in the First World War. Mee adored Kitchener, and his entry for Aspall is a treacly homage to the old Angel of Death. He does mention, however, that the young Kitchener was so lazy at school that his mother threatened to withdraw him from it, and apprentice him to a hatter. You wonder if the world would have turned out differently.